One charity rescue ship has epitomized Europe's divisions over migration, as countries take sides on the fates of 629 migrants who have been floating in the Mediterranean since Saturday. Hungary's radically anti-migrant prime minister praised the decision of the new Italian government to reject the vessel full of migrants from docking at an Italian port. The migrants are preparing for a trip to Spain, where the country's new Prime Minister Pedro Sanchez has offered them safe harbor. They have been stuck at sea since Saturday after Italy and Malta refused them permission to dock in their ports, as Italy's new government used their plight to pressure Europe to revisit its migration policy. French President Emmanuel Macron denounced Italy's decision to refuse the migrants, saying it had an obligation under international law. Briefing journalists on discussions at a cabinet meeting, government spokesman Benjamin Griveaux said Macron had made clear that under maritime law, it is the responsibility of the nearest country to receive those in distress. "There is a degree of cynicism and irresponsibility in the Italian government's behavior with regards to his dramatic humanitarian situation," Griveaux quoted Macron as saying. Macron welcomed Spain's decision to take in the ship and called for "European solidarity" towards the Spanish government. The hundreds of migrants onboard — including 123 unaccompanied minors and several pregnant women — were being split between three ships Tuesday for a trip to Spain in bad weather. 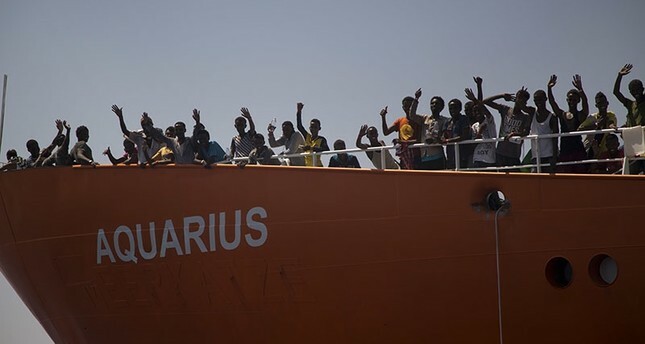 The migrants were being transferred to two Italian ships, one Coast Guard and one Navy, because of forecasts of deteriorating weather conditions along the route to Valencia, Spain, according to SOS Mediterranee spokeswoman Mathilde Auvillain. Officials in Valencia said they expected the ship to arrive in three to four days, depending on when they depart and weather conditions. Italy's new anti-migrant, right-wing interior minister has made good on a campaign pledge to close Italian ports to non-governmental organizations that pick up migrants at sea, which he has likened to taxi services for migrant smugglers. Matteo Salvini, whose League is part of the populist coalition that took office this month, promised voters that other European countries would be made to share the burden of caring for asylum-seekers arriving in Italy on unseaworthy boats mostly from lawless Libya, also taking particular aim at the aid vessels. The decision to offer a docking port in the eastern city of Valencia had been a personal and direct move by the country's new socialist Prime Minister Sanchez.